Rabbi Dr. Norman Lamm celebrated his eighty-ninth birthday in December, 2016 and it is worth reflecting on a unacknowledged contribution of Rabbi Lamm to Jewish life in America. Of course, Rabbi Lamm is a great scholar, deeply committed to learning personally and an erudite communal leader who brilliantly served as a representative of Modern Orthodoxy for many years, some of them much harder for Orthodoxy than the present. Astute historians of Orthodoxy in America will detect another important contribution of Rabbi Lamm’s: He was a major force in making advanced secular education common within Orthodoxy. He changed not just Yeshiva University and Modern Orthodoxy in this regard, but vast segments of the Orthodox world to the right and the left of him also. He made the combination of Torah and secular studies common and average within Orthodoxy. Not necessarily the fully synthesized in one institution version that he loved — the classical YU Torah uMaddah model popular decades ago that many in the more Charedi community did not like, and criticized him for supporting – but the basic idea that Torah educated Jews of many flavors and abilities can gain from a secular education is now well established. Rabbi Lamm deserves much credit for its popularity. Rabbi Joseph B. Soloveitchik [The Rav זצ”ל] was a Lamborghini — a rare and one of a kind car, hand made by unique craftsmen, who could be admired but not imitated or competed with. For the last centuries most of the Torah personalities identified with the synthesis of Torah and worldly knowledge also were Lamborghini type people. A normal person in his Ford – even his Ford Mustang – sees a Lamborghini and admires it, while acknowledging that his car can never compete with that one. Indeed, he will not even appear next to the Lamborghini as he is embarrassed. So too with the Rav and others like him: being uniquely developed made him so impressive that even Torah personalities who admired him, denied his precedential value to normal people. That which the Lamborghini can do, no other car can do or even try. Even if the Rav could be a Torah uMaddah person, that did not mean that a normal person should even try to be one. Rabbi Norman Lamm was a Porsche: fast, agile, expensive, and rare. But he committed his life to building Ford Fairmonts and Chevy Chevrolets by the thousands and he showed the Torah world that the synthesis of Torah with secular studies worked in practice for Fords, Toyotas, General Motors and me. Not just for the Rambam and the Rav and Rav Lichtenstein’s of the world, but for average people with normal capabilities. The idea of a yeshiva which was a university was not his, but the idea that YU was for everyone and normal and could mass produce fine Torah products with vibrant professional careers as Orthodox community members who could learn well and earn well, really was his. This was really a major thrust of his work Torah uMaddah, with its many chapters on competing models of incorporating the secular. And these different models are now a central feature now of the Orthodox Jewish community. It was his insight and leadership as President of YU that YU moved from being a place where Orthodox Jews could get a college education while remaining observant and draft exempt, but not really learned, with some few special individuals who would role model the ideal [the model in the 1940’s and 1950’s and some of the 1960’s], to a place where Yeshiva University would train men and women to be deeply committed, Torah-learned people with vibrant secular skills and careers. Tens of thousands of men and women graduated from YU as Torah uMaddah products during Rabbi Lamm’s affiliation with YU, making the Orthodox community what it is now in America. Rabbi Lamm built Yeshiva College and Stern into institutions that made the combination of serious a Judaic education with valuable secular education, normal for the average person. 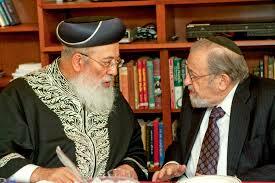 And it worked very well during his many years of affiliation with Yeshiva University. Not only that, but places that showed disdain for YU under Rabbi Lamm’s leadership now offer or facilitate college courses either integrated into their Yeshiva or separate but coordinated. Rabbi Lamm showed that actually, in practice, for real, the mixture of a Torah education with a secular education worked for average people. There is the integrated model like YU and Touro, the separated but coordinated model like Ner Israel, the Jewish studies college model like Yeshivat Har Etzion’s Herzog College or simply the myriad of yeshiva’s in Brooklyn and Queens that coordinated with Brooklyn or Queens College. Each of them are in the business of Torah with secular studies in some form, each with its own slogan and nuance, but each following basic idea that Rabbi Lamm showed worked for all: a Yeshiva student paired with an advanced secular education produces many people who were serious about torah study and equipped with a secular education that lets them participate in the western world. Rabbi Lamm’s contribution – College is good for all Yeshiva students — is not to be forgotten because it changed the whole picture. Even if YU eventually at some point in the future closes, that will not matter: Pumedeta is closed now and so is Volozhin, but their ideas survived. The idea that previously worked only rarely for unique people, Rabbi Lamm showed, could be mass produced for all (men and women alike) and as part of the routine post high school educational experience. This not only changed those to the right of YU by introducing them to advanced secular education, but it changed those to the left of YU by showing that serious Torah learning was no impediment to high level secular education. Not only could one be a college educated charedi Rabbi Lamm showed, but you could have a serious torah education and be a world leading lawyer or doctor. Rabbi Lamm’s vision of a secular education for all Yeshiva students triumphed within non-Hasidic Orthodoxy, like Henry Ford won. Not because Ford Motor Company is the largest car company in the world (it is currently sixth) or because will last forever, but because every mass produced car anywhere is a tribute to Henry Ford’s idea of mass produced cars everywhere. Every average Orthodox community member who went to a college or graduate school while learning in a yeshiva is a tribute to Rabbi Dr. Norman Lamm insight that some form of Torah uMaddah is for all people. I’m not convinced. The mere fact that a transition took place during the lifetime of Rabbi Lamm does not mean that he was a significant factor in bringing about that transition. I was a yeshiva bochur during roughly the same period that Rabbi Lamm was president of YU, and, from my observation, the increasing openness towards college in the Litvishe world was rooted primarily in the chareidi community’s increasing confidence in its ability to interact with American society on its own terms. The change was not reflective of any fundamental change in attitudes towards secular college, per se, in the chareidi community. To this day, the overwhelmingly dominant attitude towards secular college is entirely utilitarian. One attends college for the purpose of learning a profession or trade; an approach that has the explicit approval of no less a figure than Rav Elchonon Wasserman zt”l. Similarly not convinced. Association is not the same as causation, to apply a phrase from clinical research. The factors of changing American sociology and American Jewish sociology, the growth of the knowledge economy in general etc., all make it to complex to attribute wide-ranging changes to one man’s thought. Although it’s probably true that the influence of his Torah umaddah theory is well beyond the readership of his book. The Yeshivah world went through cycles regarding college and appears to have found a balance. In New York, it was usual to attend CUNY institutions(even for some roshei yeshivah). R. Aharon Kotler influenced people towards the “Torah Only” model, and in addition, there was a need for a “kosher college”, which avoided issues with CUNY. However, when Touro wanted to open a branch in Monsey in the 1990s, there was fierce opposition. Even regarding the Flatbush campus(it was originally in a rented building), a Rav(someone I consider moderate) who spoke to a relative of mine was privately unhappy that the new building was prominently in the center of Flatbush as it might entice yeshiva students(he was okay with it for women, or with a building in a different part of the city). Today, however, there are ads in Mishpacha for the very same Flatbush institution for both men and women. Furthermore, Dr. Lander’s vision is helping Chasidim as well through Machon L’parnasa in Boro Park. Interestingly, YU has just launched a two-year associate degree program to “expand opportunities for a broader range of students to take advantage of the University’s unique undergraduate educational experience”. Rabbi Joseph B. Soloveitchik [The Rav זצ”ל] was a Lamborghini — a rare and one of a kind car, hand made by unique craftsmen, who could be admired but not imitated or competed with. 2. While the quote above is not the main thrust of the post, it is a topic which has bothered me for quite some time when I hear the proposition that MO/TUM (or whatever) is only for the intellectually gifted/wealthy (or whatever). I greatly fear that this proposition may reflect some reality on the ground but I think this is a shame. We practice imitato dei/mah hu af atah even though HKB”H is not truly knowable….. My intellect/abilities doesn’t hold a candle to R’YBS but I “compete” with him on a daily basis because I try to follow his example knowing HKB”H grades on a curve. Re 1 Rabbi Lamm is responsible for the term centrist. It may well have been a marketing decision as President of YU to attempt to attract students who were not followers of Modern Orthodoxy. The net effect has been that the term Centrist has taken off which in some respects is a much less self confident term than Modern Orthodoxy. To some extent it is an interesting historical accident because Rabbi Lamm certainly by the early 60s wrote some of the most positive statements of the importance of secular studies. Re your number 2 I believe that you are essentially correct without the Rav intellectual MO would not exist in North America. That does not necessarily mean that the Rav would agree with every position of different MO organizations but he gave the intellectual justification for MO. One can see how important he was for MO, that after he stopped being active there is no major belief in leading RIETS RY in MO. A n obvious difference, there are at least a few talmidim who were encouraged by the Rav to study for a Phd. I am not aware of that being the case today of current leadership encouraging students to receive PhDs if not leparnassah. Joel, there have been a number of articles discussing the decline in the study of various academic disciplines for a variety of reasons including the current orientation of university professors, the explosion of more skills oriented curricula, etc. all having a negative impact on classical torah u’maddah. Whether this is a passing phase or a more permanent shift remains to be seen. But one point those supporting the philosophy of TuM repeatedly stress – without a (strong) grounding in Maddah, some areas of both theoretical Torah and practical halakha are simply not accessible. One aspect of the Rav ztl’s uniqueness was his ability to master all areas of Torah and most areas of Maddah. For the rest of us, a (small) subset of both is a lifelong task.